Bulgari Heritage Collection bears witness to a longtime love affair between the famous actress Elizabeth Taylor and the eminent Jewellery House. 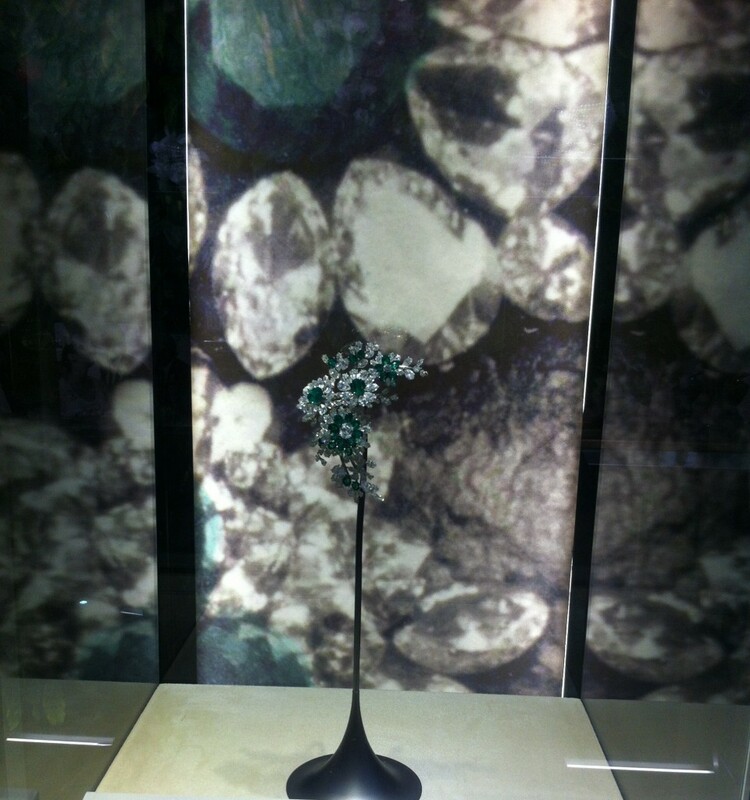 The iconic jewelry items-seven pieces were showcased on July at Bulgari flagship store on via Montenapoleone in Milan. 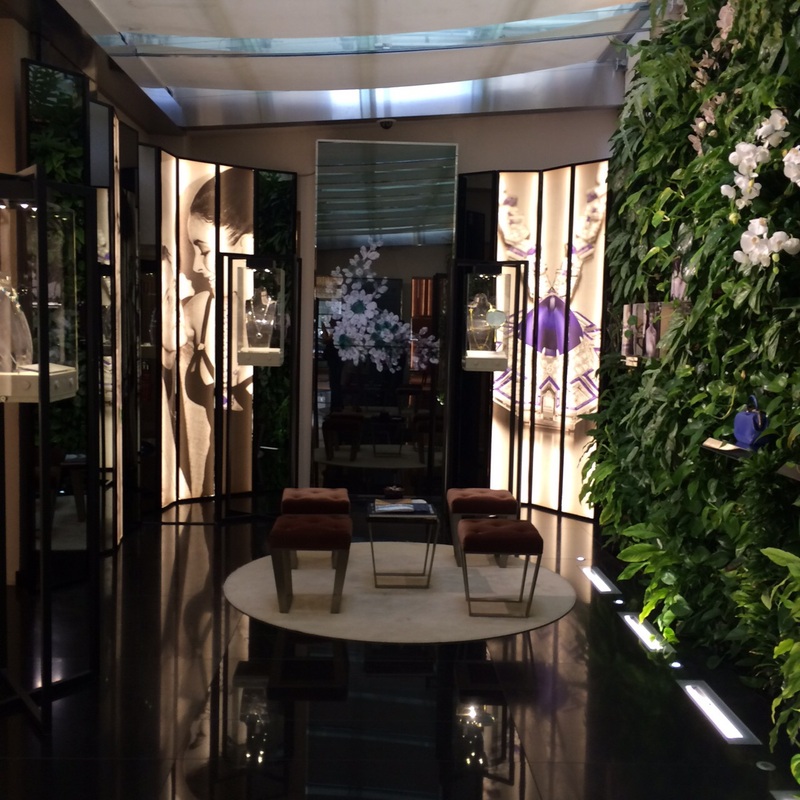 I was fortunate to have the opportunity to view the exhibition and I’m delighted to share some of the highlights with you right here on The Realm of Jewellery. The Roman Jewellery House bought back some of her famous Bulgari jewels in 2011 in New York at the Christie’s auction of Taylor’s jewelry, fashion, decoratic arts and film memorabilia. According to Time Magazine, the Taylor jewelry sold for a staggering $116mln breaking records for a single collection set in 1987 by the Duchess of Windsor’s jewels. The exhibit features the magnificent jewellery adornments set with diamonds, emeralds, sapphires that provide a rare glance at impeccable jewel-making craftsmanship, never-before-seen items valued at millions of dollars. Many of the most extravagant pieces were gifts from Taylor’s husbands, most notably Richard Burton whom she married twice. Their relationship was widely considered one of the most epic love stories in Hollywood history. 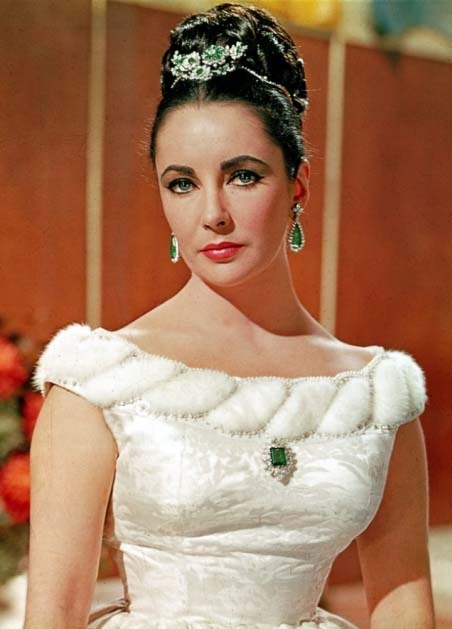 I’d like to pay your attention to the most expressive jewellery pieces formerly in Elizabeth Taylor’s private collection which shows us the evolution of the Bulgari design: necklaces, brooches, rings, bracelets, earrings. Sautoir set in platinum with impressive sugarloaf sapphire and diamonds, 1969. Trombino ring, 1971. In the former collection of Elizabeth Taylor. The sophisticated platinum and sapphire sautoir received on her 40th birthday in 1972. Adorned with a huge 52,72ct Burmese cabochon sapphire, it was a first of its kind -mounted in platinum instead of yellow gold. The long chain, composed of hexagonal and rhomboid motifs, is decorated with a pavé of brilliant-cut diamonds and calibrated sapphires. The “Trombino” ring from 1971 set in platinum with 25ct sugar-loaf cabochon sapphire, pavé of brilliant-cut diamonds and three baguette diamonds. 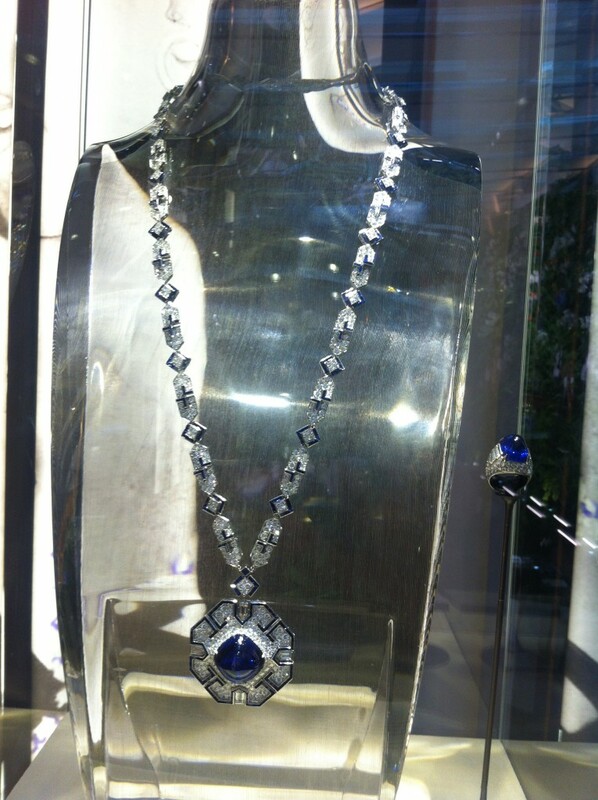 Created in the early 1930s, it is one of the most successful Bulgari designs. The ring splendidly complements the gorgeous sautoir Taylor received two years before, by chance. Two fabulous Bulgari pieces became a perfect couple never before intended to be a parure. 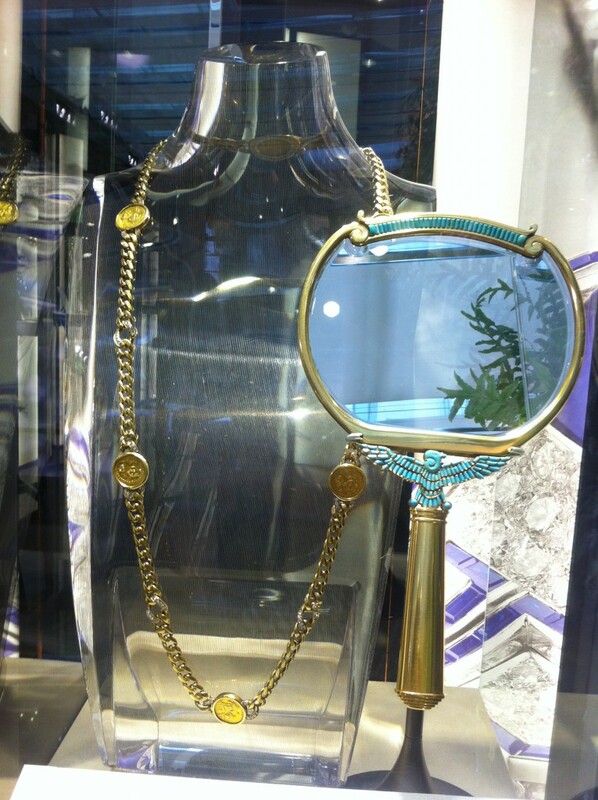 The fascinating emerald necklace and pendant set. 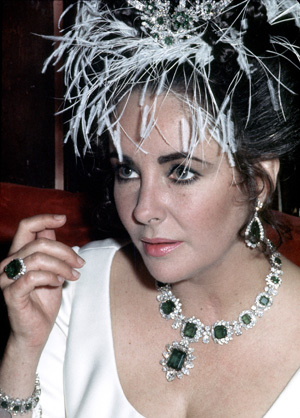 Originally, the pendant was an emerald brooch Burton gave to Elizabeth Taylor to mark their engagement in 1962. 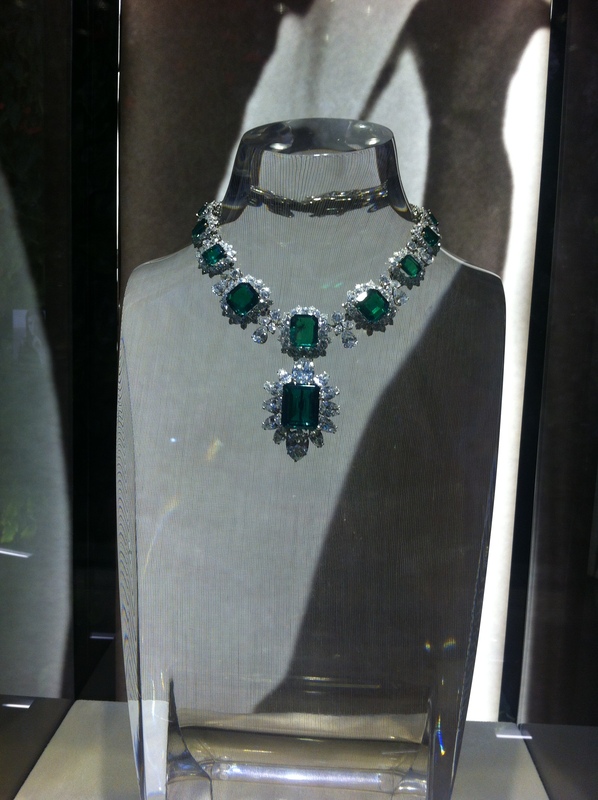 Created by Bulgari in 1958, it’s a step-cut Colombian emerald of 23,44 ct afterwards adapted to be put on as the centre piece of the necklace mounted with 16 step-cut octagonal Colombian emeralds totaling 60.50 ct, surrounded of brilliant-cut and pear-shaped diamonds. 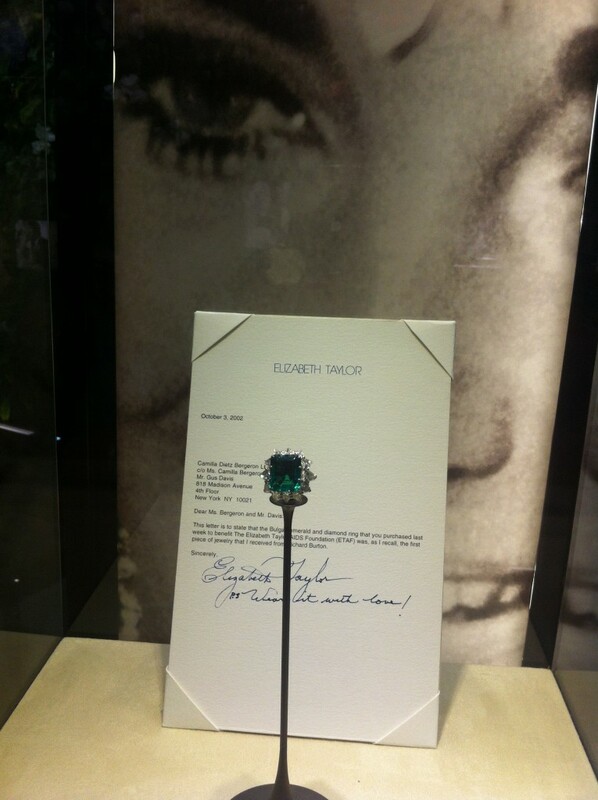 Taylor received it as a wedding gift from her husband Richard Burton in 1964. Ring in platinum with emerald and diamonds, 1962. In the former collection of Elizabeth Taylor. Bulgari Heritage Collection. Stunning ring in platinum with 7,40ct step-cut octagonal emerald and 12 pear-shaped diamonds totaling 5,30 ct. Created by Bulgari in 1962, it was the first jewel that Elizabeth Taylor received from Richard Burton in Rome during the filming of Cleopatra, when their “scandalous” love story started. 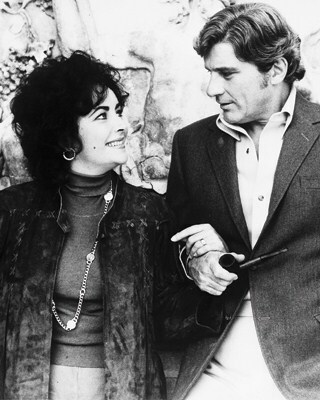 The actress sold it in 2002 at a charity auction for “The Elisabeth Taylor AIDS Foundation” and in a letter addressed to the new owners, Taylor wrote: “Wear it with love!”. Tremblant brooch in platinum, emeralds and diamonds, 1960. In the former collection of Elizabeth Taylor. Bulgari Heritage Collection. “Tremblant” brooch in platinum, emeralds and diamonds from 1960. The brooch was probably given to Elizabeth Taylor by Eddie Fisher, her husband at the time, and was worn both as a brooch and hair ornament. On the “Tremblant” pieces, flower heads are mounted on spring settings which allow them to flicker at every movement. Since the 18th century, realistic floral motifs had been a constant theme in French jewelry. In the early 1960s, Bulgari rivaled the finest Parisian jewelers in creating these asymmetrical sprays. Gourmette sautoir in gold with six Byzantine gold coins and diamonds, 1975. Gold hand mirror, 1962. In the former collection of Elizabeth Taylor. Bulgari Heritage Collection. Gourmette sautoir was a favorite of Taylor. Created by Bulgari in 1975 in gold with six Byzantine gold coins and diamonds, it was worn by the actress on numerous occasions, including the day of her engagement with John Warner in 1976. Gold hand mirror decorated with an Egyptian inspired raptor set with calibrated cut turquoise, 1962. Created at the time when Elizabeth Taylor was enacting Cleopatra, the mirror was probably given her as a gift by the production. 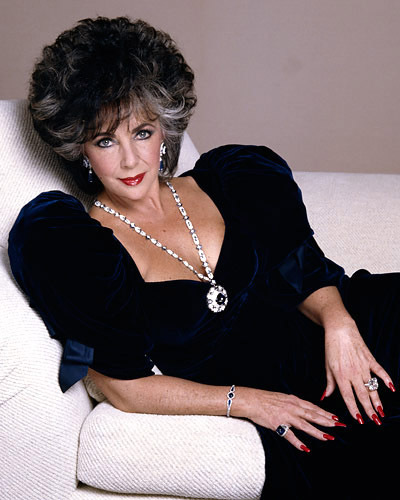 Undoubtedly it is one of the greatest jewellery collections ever assembled, formerly belonged to the Dame-Elizabeth Taylor -one of the leading ladies in Hollywood.